I was recently hijacked to be part of a secret recipe exchange (gladly!) and received this simple delicacy from a friendly stranger, who originally got it from her boyfriend. 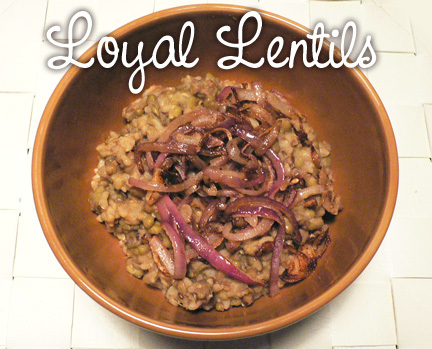 They are called Loyal Lentils because this recipe stayed with her even though her boyfriend didn't. In a medium sized pot, place lentils in 4 cups of water with the fennel seeds. Soak for a few hours (if you can, otherwise proceed with recipe and cooking time will be a bit longer). After soaking, turn on heat to high and bring to a boil. Meanwhile, heat 1 Tbsp olive oil until it ripples, add coriander and ginger and stir fry til fragrant. Add rice and stir fry a few minutes until evenly coated with oil and spices. Add the rice mixture to the boiling lentils. Simmer the rice and the lentils covered, at a very low heat, until all the water is absorbed and the lentils are soft. If dry or undercooked, add 1/4 cup more water and continue cooking til done. While lentils and rice are cooking, heat another tablespoon of olive oil in a pan until it ripples and fry the onion until it nicely browned. When lentils and rice are cooked, season with salt and pepper and spoon the fried onions onto the simmering lentils and rice. Just before serving, stir in the onions and adjust seasoning. Ladle into bowls and garnish with a dollop of yogurt. Serves 2. This is a wholesome, easy, nutritious meal and very comforting on cold days. Lots of fibre (especially if you use brown basmati) and the flavours are subtle yet aromatic. If you like, garnish with fresh cilantro or green salsa. 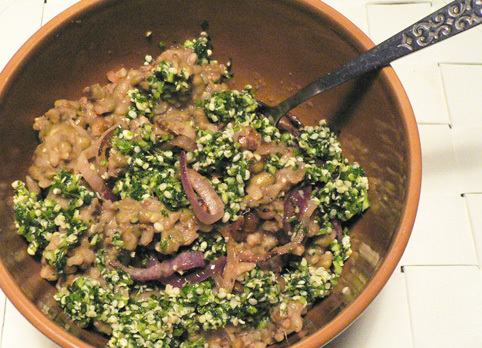 Pictured here using mung beans and brown rice, topped with green salsa made with parsley plus hemp nuts for extra protein! You're inspiring me here, Fran. Recipies like this might just make me follow my dosha's diet better (I'm a hopeless kapha). Did you think about choosing the most recommended Bitcoin exchange service: YoBit.